to view the video trailer. The title's deceptive. It's a generic for two plays of roughly thirty minutes, The Romance of the Century, and The Weatherman. 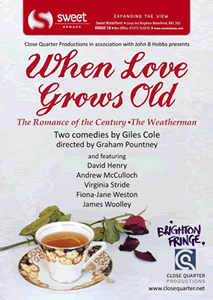 Giles Cole's work appears in London theatres, particularly Jermyn Street, and Radio 4. Close Quarter Productions with which he's associated quietly boast an impressive pedigree and as here, a consummate company. Directed by Graham Pountney in Sweet Waterfront 1 these comedies effervesce around the soda siphon, Vogue magazine, table and period chairs, designed and stage-managed by Alexandra Kataigida and with Andrew Johnson's period sound. The Romance of the Century really does revolve around David and Bessie in 1972. The Windsors. Based on a true though private event, this play deftly imagines it. 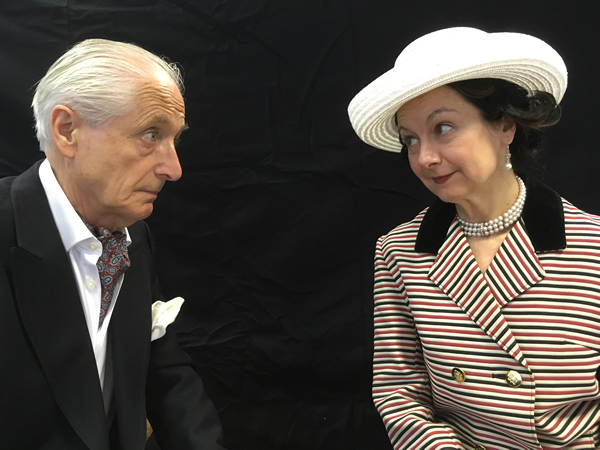 Lilibet is making a visit, and James Woolley's David is not allowed to drink and can't wear the blue tie, but the yellow one The ex-king's wit is sly, wounding, and ultimately directed to an end. It's a touching portrait of an exasperated man who knows he's made contemptible mistakes, particularly about abandoning the country and the Nazis. Virginia Stride's Bessie - a name she can't abide, preferring her two surnames - is all containment, mild denial, Vogue-reading with a slim hand. Her nervousness about meeting the present monarch expresses itself in controlling her uncle as if that might somehow resolve everything or at least the afternoon. Whilst Woolley can revel in his raffish bad jokes - the consolation of the defeated - Bessie's trying one final bid to be accepted. Fiona-Jane Weston's arriving Queen perfectly balances the reserve of a monarch with anxiety for her uncle an only partially-checked warmth towards him, and marked coolness to Bessie. Weston's tone here is remarkable in its acute observation, its refusal to caricature and equal avoidance of contrasting sentiment; all's compassed within a tight range. The scene where Woolley's David fights off both wife and niece to say delicately and firmly what he's always meant to say is both touching and the nature of an absolution. There's pathos, but inlaid, not scattered. The Weatherman is a two-hander featuring David Henry's Alfred and Andrew McCulloch's Charlie, set in 2002. 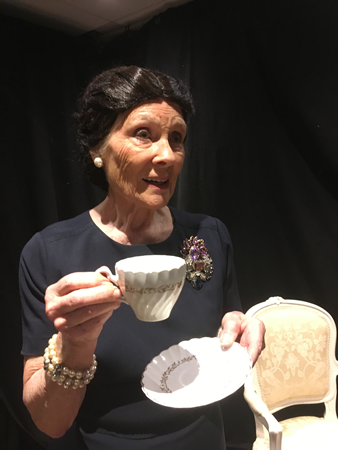 'This play involves no royalty whatsoever' is the note to this enthralling Chekhovian piece of steady drinking: old friends who meet almost daily, a table set with variously-empty beer glasses and whisky chasers. It's infinitely the deeper play, one sifting memory and desire and faltering at both. David Henry's melancholically-amused Alfred is much given to re-examining his memory. He can't remember a Scottish weatherman of thirty years back, nor can his wife Joanie. He's fatalistic, yet keeping dementia at bay by the act of naming. His act of remembering all those Ians and Mac (Reggie Maudling for 'maudlin', a failed aide-de-memoire) takes in respective wives, treads dangerous territories. McCulloch's more chipper laid back Charlie navigates the Scotch rocks and shallows of sexual adventure: he listens. Alfred once pulled back from an office fling; and Charlie? Well Charlie's faithful. 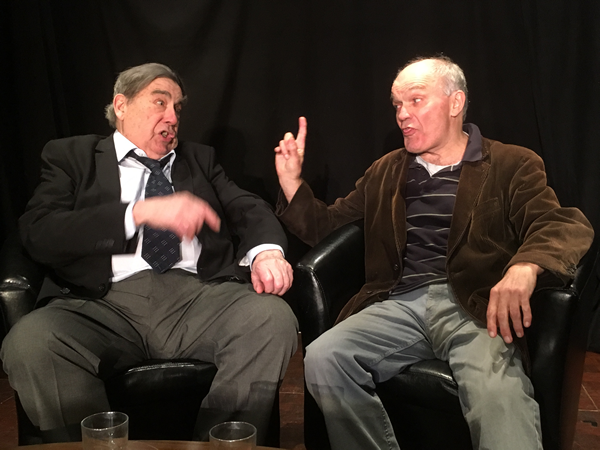 So as desultory memories and blurred drinking conflict, we're drawn by Henry's terraced voicing and reach, his uncertain-seeming questions coming round again, with Charlie's mettle tested to twanging point. McCulloch's a fine foil to Henry's cracker-barrel pronouncements and regrets. Charlie confides frank details on his marriage, but this relationship clearly runs on something else: a habit of acquiescence. Today things take a different turn. And there's tomorrow. And chaser. There's more than enough residual wisdom in these characters to make us want to see what they, not Cole, will make of themselves. Could this be the pilot to a melancholically-observed sitcom like Vicious? One audience member suggested it. Whilst The Romance of the Century is beautifully observed and deftly revivifies a much-fictioned historical turning-point, The Weatherman is outstanding comedy, as are the performances. Published May 21st 2017 by Simon Jenner.